Education, meet innovation. Our cutting-edge degree programs will prepare you to take charge in today’s fastest-growing fields. We’re an innovative new kind of public university—engineered from the ground up to push the boundaries of education in science, technology, engineering and math (STEM). The affordable degree programs at Florida Polytechnic University are specifically designed with your future in mind. Our cutting-edge curriculum is informed by the insights of our industry partners, so you can count on getting an education that’s not just experiential, but in sync with modern industry demands too. Learn how to analyze supply chain efficiency across industries through a combination of data-driven analysis and business know-how with a focus in Logistics and Supply Chain Management, Intelligent Mobility and Quantitative Economics and Econometrics. Take the first step toward a future in the versatile world of IT. Delve deeper into the exciting and growing fields of Cyber Gaming, Cyber Security and Software Engineering. Get the specialized skills and practical programming experience you’ll need to create technological advancements in the world of Embedded System Design, Digital Logic Design or Machine Intelligence. Numbers are powerful. Understand how to visualize and process data with a concentration in Big Data Analytics, Internet of Things or Health Informatics. Unlock the electrical engineering methods and analytic tools required to solve real-world problems dealing with Electrodynamics, Embedded Systems Design or Digital Hybrid Systems. Apply the principles of design, analysis and manufacturing to create and test mechanical systems ranging from massive to microscopic in size. Choose a focus in Nanotechnology, Operations Research or Materials and Advanced Manufacturing. Further your research—and your career—with an advanced degree from Florida Polytechnic University. The Master of Science in Engineering degree program provides students with an advanced engineering education to work with emerging technologies, product development and program management. Electives within the program are divided into the focus areas of Robotics and Electrical Control Systems. The Master of Science in Computer Science degree provides opportunities to address present-day challenges and develop technologies for the future. 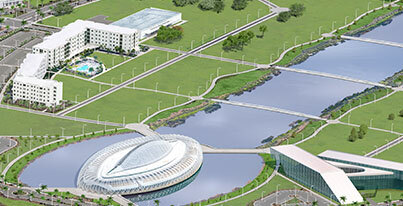 The college supports graduate research through state-of-the-art experimental and computational research facilities under close faculty supervision in the areas of Big Data Analytics and Logistics-Analytics.